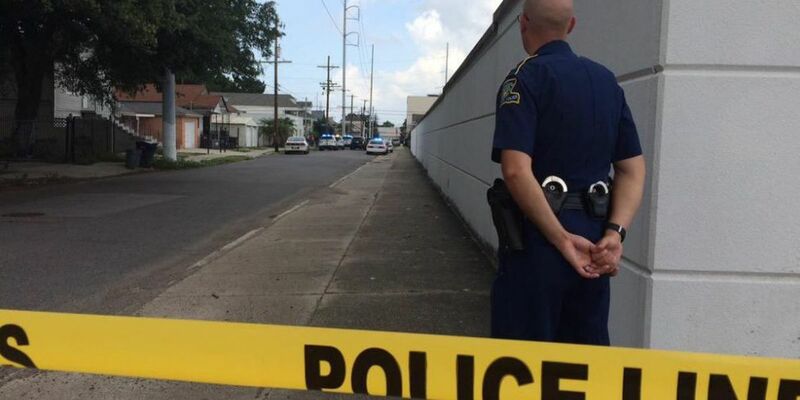 NEW ORLEANS (WVUE) - Police are monitoring a new area as the search for alleged cop killer Travis Boys continues. A perimeter has been set up roughly from Elysian Fields to N. Derbigny street along Franklin Avenue with several roads in the area closed down, according to Fox 8 reporters on the scene. SWAT and K9 units are on the scene as police continue their search. Witnesses say officers are going door to door searching for Boys after his truck crashed into a house in the area. According to police, 46-year-old Officer Daryle S. Holloway, a 22-year NOPD veteran, was killed by 33-year-old Travis Boys. NOPD Chief Michael Harrison said Boys was handcuffed with his hands behind his back in the backseat of the police cruiser, but somehow got his hands out from behind his back. He then made his way through an opening in the cage that separates the front and back seats of police car and shot Holloway, causing the cruiser to crash into a utility pole, according to NOPD. Boys then escaped on foot. A manhunt is now underway for Boys involving officers from NOPD, State Police, the St. Tammany Sheriff's Office and HANO. Police describe Boys as a black male, approximately 5'11" with a tattoo on the left side of his neck. Police believe he may be in a black pick up truck with license plate number B850532. NOPD Chief Michael Harrison spoke to the media Saturday and said that moments like this never get an easier. Harrison spoke with every member of Holloway's family including his mother, ex-wife and children. "It's the absolute hardest thing I've ever had to do in my life," Harrison said. "You never get used to that." Harrison thanked all officers involved in the hunt for Daryle's alleged killer. "Justice will be served," Harrison said. "He will pay for what he did... for killing our brother." Mayor Mitch Landrieu released a statement shortly after, condemning Boys actions and offering his condolences to Holloway's family. "This despicable, cowardly act represents the lowest of the low. Killing an officer in the line of duty is an attack on our community that will not stand. We are bringing together every law enforcement resource at our disposal to find, capture and prosecute Travis Boys for this heinous crime," Landrieu said. Congressman Cedric Richmond (LA-02) also commented on the shooting death of Officer Holloway. "Daryle was an outstanding police officer, human being and friend," said Rep. Richmond. "My heart aches for his family and this loss will be felt by the entire community. This tragedy should remind us that every day when our law enforcement officers suit up to protect us, they are putting their lives on the line." "Daryle died in the line of duty and will always be remembered as the Hero he was." St. Bernard Parish President Dave Peralta also provided a comment and offered his condolences to the Holloway family. "The citizens of St. Bernard wish to express their sympathy to Police Officer Holloway's family and the men and women of the New Orleans Police Department on the loss of a police officer who was mortally wounded protecting and serving all the citizens of the metropolitan New Orleans area," Peralta said in a statement. "As a retired NOPD Sergeant this loss is especially painful. My thoughts and prayers go out for Officer Holloway and all law enforcement officials who daily protect and serve our citizens."